KUALA LUMPUR 3 May – Malaysia and the Kingdom of Bahrain agreed to cooperate in facing the threat of militancy not only in military context but through a moderate approach. Defence Minister, Datuk Seri Hishammuddin Tun Hussein said, both the countries acknowledged the importance of moderation as an approach to promote dialogue, mutual respect, understanding and tolerance to counter all forms of violent extremism. 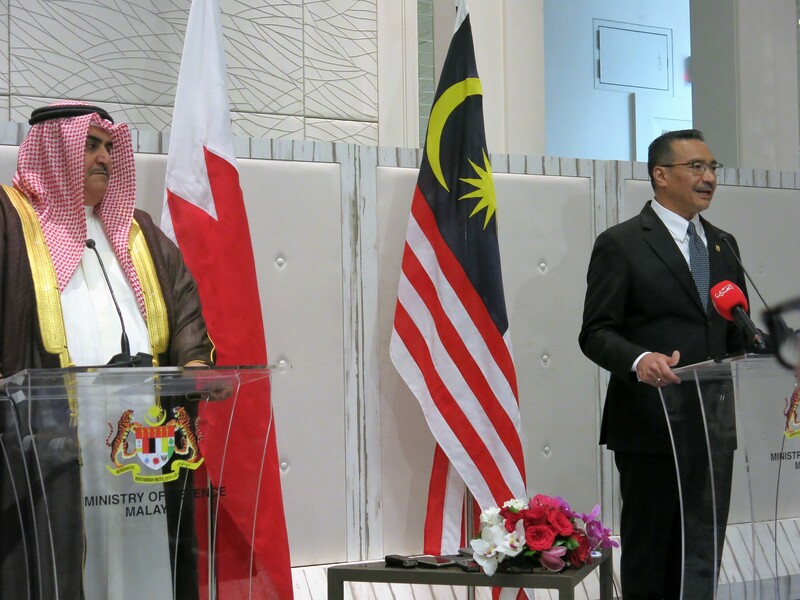 In this perspective, Hishammuddin said, Malaysia expressed a desire to encourage collaboration between the Kingdom of Bahrain and the Global Movement of Moderates Foundation (GMMF). “With regards to defence, Malaysia and the Kingdom of Bahrain have committed to elevating relations between both our countries through the signing of the Memorandum of Understanding (MoU) on Defence Cooperation and Exchanges by Lieutenant General Diyab Saqer Alnoaimi and me yesterday. “Through the MoU, the Malaysian Armed Forces (MAF) and the Bahrain Defence Force (BDF) will further explore military-to-military cooperation which includes joint training, exercises, and exchange of military personnel between both Armed Forces. “MAF and the BDF will also intensify cooperation on information and intelligence sharing on terror networks, working together to share experiences on dealing with the growing phenomenon of radicalisation,” he said in a Joint Press Conference with Bahrain Minister of Foreign Affairs, Shaikh Khalid Ahmed Mohamed Al-Khalifa here today. Hishammuddin was representing Malaysian Foreign Minister, Datuk Seri Anifah Aman in the press conference. Hishammuddin who is also Minister with Special Functions also mentioned that Malaysia and the Kingdom of Bahrain agreed to establish the Malaysia-Bahrain High Joint Commission, which will be co-chaired by the Foreign Ministers of both countries, to serve as an umbrella framework for bilateral cooperation on the matters agreed. On another development, four Memorandum of Understanding (MoU) and one agreement were signed between the government of Malaysia and Kingdom of Bahrain during the four-day visit of the King of the Kingdom of Bahrain, His Majesty King Hamad Isa Al Khalifa. *MoU on Defence Cooperation and Exchanges, signed by BDF Chief of Staff Lieutenant-General Dheyab Saqr Al-Nuaimi and Malaysian Defence Minister Hishammuddin Hussein. *MoU for cooperation between the Bahrain Chamber of Commerce and Industry (BCCI) and the National Chamber of Commerce and Industry of Malaysia (NCCI) signed by BCCI Chairman Khalid Abdulrahman Almoayyed and NCCI President, Ter Leong Yap. *MoU relating to Upstream and LNG cooperation between the Oil and Gas Holding Company (NOGA Holding) and Petroliam Nasional Berhad (Petronas), signed by Oil Minister Shaikh Mohammed Khalifa Ahmed Al-Khalifa and Petronas Chief Executive Officer Datuk Wan Zulkiflee Wan Ariffin. *MoU on Small and Medium Enterprises (SMEs) and industry cooperation, signed by Industry, Commerce and Tourism Minister Zayed Rashid Alzayani and Malaysian Minister of International Trade and Industry, Datuk Seri Mustapa Mohamed. Hishammuddin said the Air Services Agreement was signed by Bahrain Foreign Affairs Minister, Shaikh Khalid Ahmed Mohammed Al-Khalifa and Transportation Minister, Datuk Seri Liow Tiong Lai. Hi, Neat post. There’s a problem with your website in web explorer, would check this… IE still is the marketplace chief and a large component to other people will omit your wonderful writing due to this problem.